Janette Bergman McCall’s father believed that a person needed “tickets” to progress in life – building blocks that prepare a person to succeed. 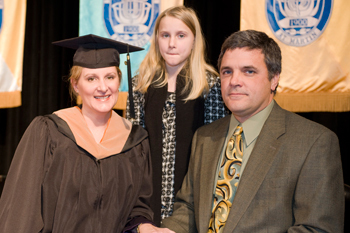 McCall collected her largest ticket yet Dec. 18, 2010, as she was among the first 13 students to graduate from the University of Tennessee at Martin with a master of business administration degree offered online and designed primarily for banking and financial services professionals. At 46, the senior member of her MBA classmates mastered new learning technology on the way to becoming the first person in her immediate family to earn a graduate degree. McCall, of Memphis, is a retail strategies advisor with NCBS, a wholly owned subsidiary of SunTrust Bank. Her path to the graduation stage began as the youngest daughter of a military family. The Bergmans instilled a strong work ethic in their children, and she said that her father’s “unwavering support” encouraged her to become the only sibling earn a four-year college degree. She graduated in May 1986 with a bachelor’s degree in human resource management from the University of Arkansas at Fayetteville and began working in retail, including a stint as customer service manager and human resources regional specialist for Target Stores in Ft. Worth, Texas. She moved to Memphis is 1991 and opened a business called Rolling Pin Kitchen Emporium, which she continued until 1999. She closed the business that year and became a regional sales manager for a national publishing company. 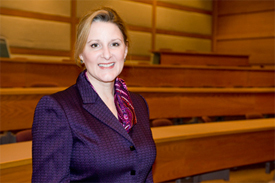 In 2005, McCall accepted her current position with NCBS where she works with the company’s consulting arm, advising financial institutions on retail strategy. An opportunity to attend the Barret School of Banking held at Christian Brothers University allowed her to meet Dr. Tom Payne, chair holder for the Horace and Sara Dunagan Chair of Excellence in Banking and also interim chair for the UT Martin Department of Accounting, Finance, Economics, and Political Science. 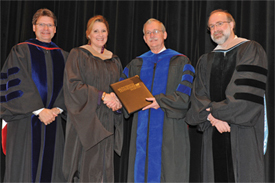 Payne told her about the MBA degree for banking and financial services professionals, emphasizing that the courses were delivered completely online. “He explained the program to me. It was basically an offer I couldn’t refuse,” she said. She took the GMAT exam, entered the program and began pursuit of her dream to earn a graduate degree. McCall is grateful to her husband, Jim, and 10-year-old daughter, Joanna, for their support through the 20-month program. As she learned, life continues to happen as school demands are added to the mix. One classmate has four young children, while another received chemotherapy for cancer while pursuing the degree. “There are folks in this cohort that had a lot more pressures than I did,” she said. Professional benefits aside, McCall is proud of her accomplishment for personal reasons. “It’s the realization of one of my lifelong goals,” she said. “It’s just something I’ve always wanted to do.” Although her parents were not alive to see her graduate, she knows they would be proud of her accomplishment, especially her father. He taught her that a person never stops learning, something she will teach Joanna who was present to see her mother participate in commencement. “You may think you know everything there is to know about something, but you don’t,” McCall said. Collecting tickets is important, and Janette McCall knows all about that as she’s earned her biggest ticket so far.